Research by an EFPTA team was presented at the ICPS-2015 conference in Amsterdam on 12 March. 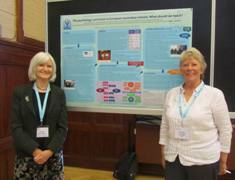 Findings from focus groups of psychology teachers from 10 European countries, on the pre-tertiary psychology curriculum – its purpose, content, and how / by whom it should be determined – were presented in a research poster by Morag Williamson (Scotland) and Dorothy Coombs (England & Wales). The other members of the research team were Renate Schrempf (Germany) and Lenka Sokolová (Slovakia). The poster session formed part of a special ‘Psychology Teaching Institute’ event at the conference, organised by the Association for Psychological Science (APS). Psychology education was also the focus of a round-table session, a ‘Teaching Forum’ hosted by the APS Teaching Fund, in which Dorothy and Morag also participated. This was the first international psychology conference to feature a teaching theme in which pre-tertiary psychology was included. As well as disseminating research findings, the EFPTA representatives were able to raise awareness of pre-tertiary psychology more generally amongst psychology educators from many countries. Are you interested in collaborating on research into pre-tertiary psychology? Please contact the research team.